Cante Waste ya Nape Ciyu zape ye (“I shake your hand with a good heart”). As I sat in the van on my way to the MTV Video Music Awards, I watched Indigenous musicians excitedly facetiming their children. I thought to myself how incredible it would be for our children to see us reflected for the first time on the “blue carpet”. This is the beginning of the dreams of Generation Indigenous expanding to new heights. Heights I didn’t even dare to dream at their age. Taboo has stepped up in a major way as a social impact warrior by using his platform to bring visibility to indigenous issues. And I am not the only one that’s proud, several elders have told me how happy they are to see the doors opening to long term opportunities. Read the full CEO Message here. A new partnership between Indigenous artist Jimmy “Taboo” Gomez (Shoshone) of the Black Eyed Peas with Native Americans in Philanthropy has resulted in a generous gift of $50,000 to support the organizations’ cutting edge social impact work. 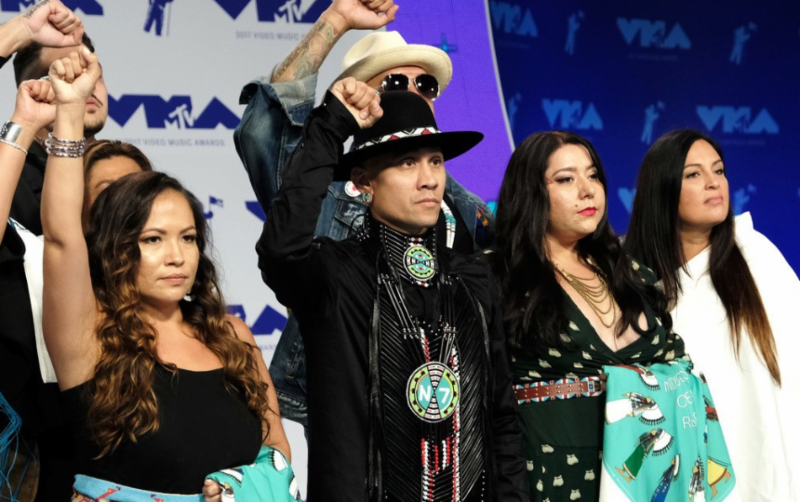 Underscoring the launch of this partnership was Taboo’s arrival at the 2017 MTV Video Music Awards (VMAs) where he was joined on the “blue carpet” by Native Americans in Philanthropy CEO, Sarah Eagle Heart, several co-founders of advocacy network Indigenous Women Rise and Native musician group Magnificent 7. Read the full press release here. We are honored to receive the 2017 Philanthropist of the Year Award from Potlatch Fund. Join us at the Potlatch Gala November 4, 2017 in Suquamish, WA! Learn more here. To better serve the network, we are expanding our team! We are looking for great people to join our work in promoting reciprocity and investment in, with and for Native peoples to build healthy and sustainable communities. We encourage highly motivated, talented, and dynamic individuals to apply for the following position at our new L.A. office: Program Manager. Help us find the right candidates by spreading the word! Share with your networks and encourage anyone you think may be interested to apply. Join us and The California Endowment (TCE) this October 5-7th for the #GenIndigenous Northern California Funder Tour. One of TCE’s 14 building healthy Communities sites, Del Norte County and adjacent tribal lands, a place-based initiative, includes approximately 29,000 people and four federally recognized tribes. Featured speakers and guests include Dr. Bob Ross, President & CEO of TCE; Dr. Micheal Yellowbird, Indigenous Lifecourse Framework; and True North Organizing. Learn more and register here. We are living in a pivotal moment for youth-led movements fighting state-sanctioned violence and racism. Across the country — from Ferguson, to Standing Rock, to Charlottesville — young people are playing leading roles in social justice movements that advance a vision for a just society. They are working across cultures and across issues to stand in solidarity against our country’s legacy of genocide, slavery and xenophobia that lives on in systems that continue today. Now is a critical moment to support Native young people who are showing a readiness to organize in building lasting movements for social change. Learn more and apply online here. Joining us at #UNITY2017? We invite you to join us Sunday, September 17, at our Welcome Reception from 5:00-7:00pm. More information will be available on the UNITY Summit website. Register now! On August 1st, Native Americans in Philanthropy CEO Sarah Eagle Heart and Anathea Chino, Senior Advisor of Advance Native Political Leadership joined the Indigenous Women Rise (IWR) collective in Albuquerque, New Mexico for the Women Empowering Women for Indian Nations (WEWIN) annual conference. WEWIN provides Native women with the knowledge, support, and resources necessary to achieve success in their personal and professional lives. Every year the annual conference focuses on building upon the strength and power of Native women. Read the full blog here. If you would like to contribute a resource, job posting, or article to our newsletter or website, email the Communications Specialist at [email protected]. Got NAP? Can’t wait until the next e-Newsletter? Want More NAP now? Get updates on what NAP is doing and where we are going. Join the Native Americans in Philanthropy Facebook Page or follow us on Twitter and LinkedIn! !